If you’ve used WordPress before, you know that it’s a blogging platform built predominately by contributors. Though Automattic created the core, developers around the world contribute to themes and plugins that make WordPress far more robust than its competition (Wix, Joomla, Drupal, for example). [d]online is built on WordPress, as is my company site, era404.com. Despite the overwhelming advantages, WordPress has suffered a number of hacks, exploits, and security issues over the years due to the contributive nature of the platform. So, after developing a number of WordPress plugins inspired by client projects and personal challenges, we decided our next one should be a tool to protect our clients, colleagues, and, let’s be honest, selves, from these types of attacks in the future. 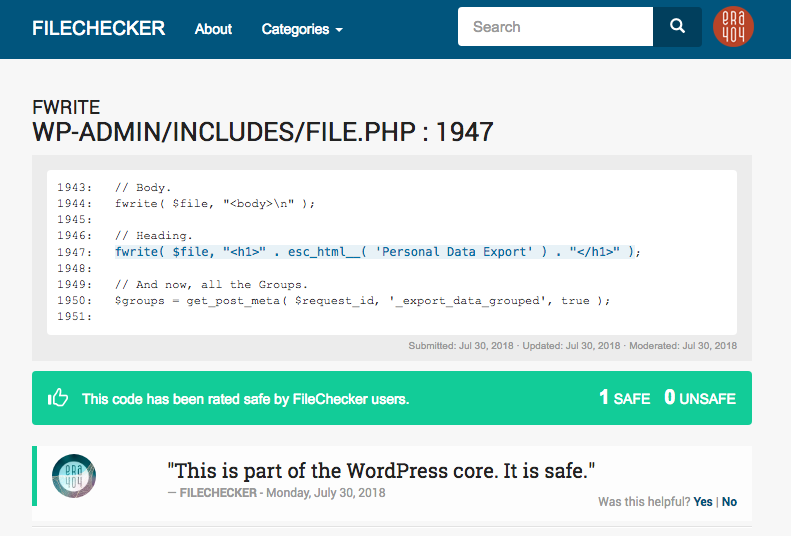 Enter the ERA404 FileChecker WordPress Plugin, which not only allows users to crawl through potentially malicious code in their own installations, but also provides a public portal (www.filechecker.net) for experts to evaluate code blocks to deem them safe or unsafe.